A4 to A0 and larger! Every plan is unique, and we make sure that our clients get exactly what they want. 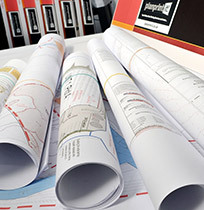 We offer the widest range of large format plan printing available online, whatever the size, stock or finish you need. We can handle all standard plan sizes A4, A3, A2, A1 and A0. 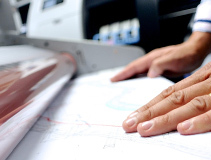 If you have oversized plans, we also offer a bespoke sized plan printing services that will cater to your needs. Use our price calculator on the price-it page to confirm costs. Our paper choice guide explains the variety of stocks and finishes available, and which will suit your need best. How do you want your plans delivered? 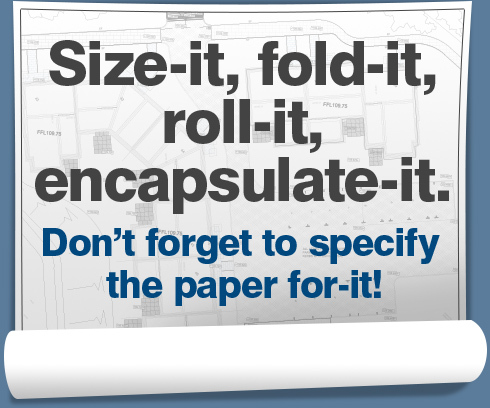 We can roll plans or fold them, whatever works for you. If you need to present your plans to an audience, we can mount plans onto display boards. Need them durable for onsite? then we can encapsulate them. Check our countdown clock for the next delivery date schedule. Our standard output sizes are from A4 to A0. We can print bespoke plans – any length up to 50+mtrs – with a choice of widths up 42"(1067mm). We offer the widest range of plan print papers currently available online, so you can be sure that your plans are printed fit for their intended purpose. Our simple guide will explain the differences and help you make the correct choice for your plan print needs. All line CAD drawings in colour or black/white. This our most commonly used paper for construction site use, bidding requests and general reference use. 90gsm Technical Paper As above plus better suited when larger areas of block colour, hatching & where large photo images are used as key references. 120gsm Coated Presentation Paper Increased weight and coating for higher coverage plans such as Maps, 3D &, CGI renders. 160gsm Coated Presentation Paper As above with increased weight for extra durability. Ideal for Point Of Sale Posters with large bold text combined with photographic images. 200gsm Photo Paper Satin / Gloss Photo based paper for all levels of image coverage, excellent for exhibitions, public consultation displays, and final client presentations. Available in Satin or Gloss finish. 250 Micron Encapsulation / Lamination Make your Plans Ultra Duarable, Tear-proof, and Waterproof. Ideal for Master Plans used on-site, Pin them on wall for public consulatation. Use them abuse them they will not tear! Roll-it or fold-it! We deliver your plans folded to a finished industry standard A4 packet size or, alternatively rolled and posted in a strong shipping tube. We can Encapsulate / Laminate your plans, if you’re planning to take them onsite and need to protect them against the elements. With an Encapsulated / Laminated Plan you can use it Outdoors in all weathers rain or shine! Mount-it! For the best laid plans, our scratchguard sealed mounted presentation boards are ideal for exhibiting proposed development schemes at planning and consultation meetings. 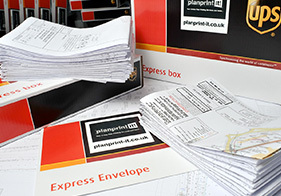 Upload your order before 1pm and we'll Print & Ship your plan prints the same day for next working day delivery, UK wide via DPD with full predictive window delivery & tracking. If you need us to make alternative arrangements, just ask. No matter how strange the request, we’ll do our best to handle it. We haven’t been given a challenge we couldn’t meet.